The south-west counties of England are rich in compelling authors, magical characters, and scenic settings from popular PBS television drama and mystery programs. I planned a recent trip to visit friends in the area around a tour of locations associated with three of our Masterpiece favorites – Detective Chief Inspector Barnaby’s blood-soaked Midsomer County, Jane Austin’s Winchester, and Ross Poldark’s brooding Cornish moorlands: a personal Masterpiece mystery tour. Rolling hills and lush green meadows grazed by dairy cattle lined the narrow, wild-flower and hedge-bordered country lane in the Chiltern Hills 40-miles west of London. The counties of Buckinghamshire and Oxfordshire are better known to much of the world as Midsomer County. Here, Detective Chief Inspector Barnaby pursues investigations into the nefarious activities of some of England’s most eccentric criminal minds. The bucolic setting belies its reputation of suffering the country’s highest murder rate per capita. 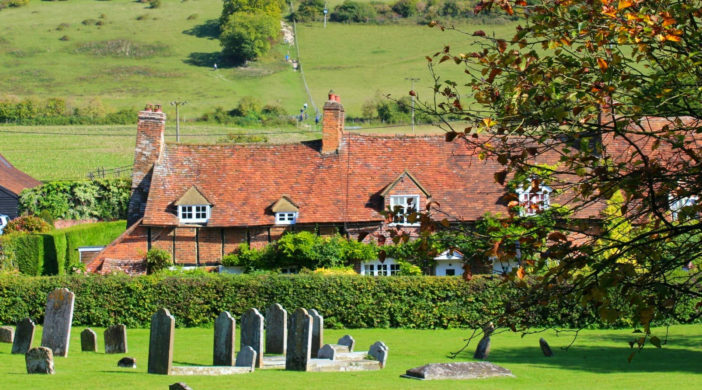 In scouring the internet for locations from the popular TV series, I figured that, since Midsomer Murders debuted in 1997, the over 100 episodes have dispatched three to four times that number of bodies. Countless traditional pubs, churches, manor houses, and quaint village greens with church fêtes and Sunday afternoon cricket matches spread across the area have played supporting roles to the redoubtable Barnaby. Just exploring all the places that have served as Causton, headquarters of the Midsomer Constabulary, would require visiting at least four communities and their self-guided walking trails of mystery and mayhem. With only a couple of hours to linger, I was looking for a single attractive spot to break our journey. 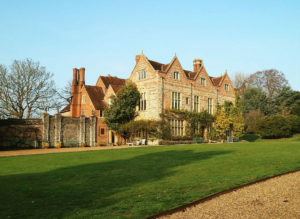 The National Trust property of Grey’s Court in the village of Rotherfield Greys, near Henley-on Thames offered a promising prospect. Here in the 16th century, Robert Knollys remodeled a former medieval castle into an Elizabethan courtier’s residence in a failed bid to entice the royal visitor. His efforts have been notably more successful in attracting a steady stream of filmmakers. 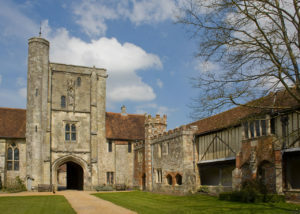 As “Midsomer Priory” in The Sacred Trust, this venerable country pile, surrounded by orchards, high-walled gardens and dense woodlands, provided the perfect setting for the murder of a nun in the chicken coop. That this site is just one of seven others scattered across four counties featured in that single episode illustrates the variety of scenic locations visited over the more than 20 seasons of the series. From a Tudor show house to 20th-century home, Greys Court has been inhabited by just five families in its history. The patchwork of styles throughout the mansion offer clues to their lives and fortunes. A huge brick fireplace in the kitchen has remained in use since Tudor times. Furniture and stained-glass windows from Switzerland hint at connections to the Continent. Chintz covered overstuffed couches from the 1930s recall when Evelyn Fleming, the mother of Peter Fleming, the creator of James Bond, lived there. With Grey’s Court, I had unwittingly hit Masterpiece pay dirt. In addition to a Midsomer murder, during our tour I learned that Grey’s Court had also hosted a drawing room scene from Poirot and a garden party in Downton Abbey. 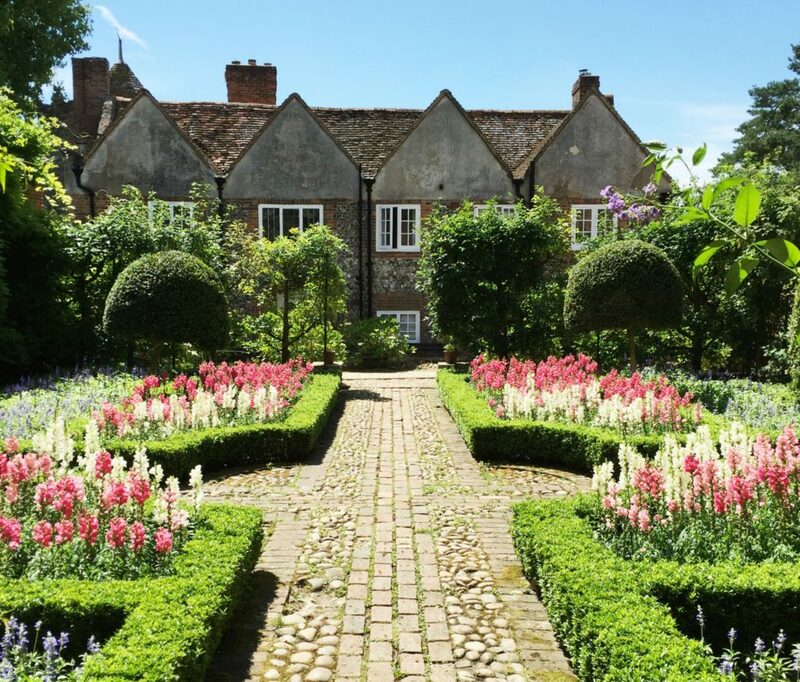 Afterwards, we strolled under the gnarled twisted vines of the Wisteria Walk, explored aromatic rose and kitchen gardens, and relaxed to the sound of a bubbling fountain before resuming our journey for the 50-mile drive to Winchester. 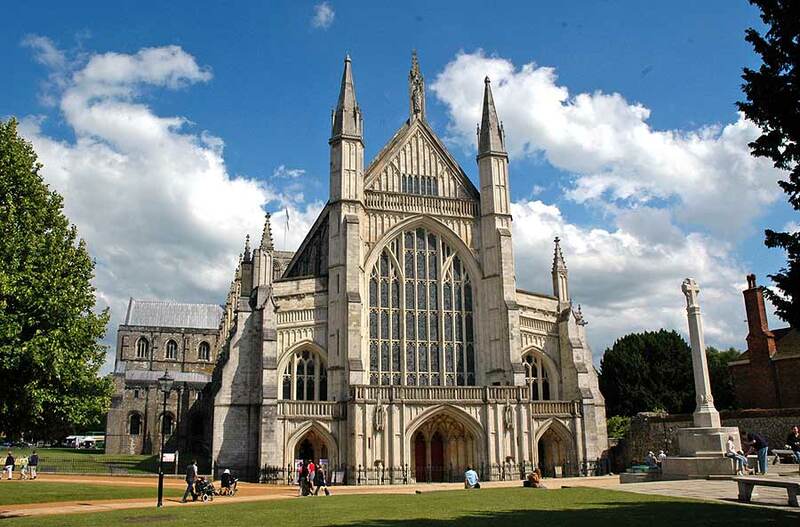 Winchester Cathedral towers over an ancient city rich in Masterpiece literary associations, including Jane Austen and Thomas Hardy. Our planned visit on a prior trip was unsuccessful; the great Gothic stone edifice, noted for the longest nave in Europe, had been closed for filming Tom Hanks in scenes from The Da Vinci Code. Today we were welcomed to join a guided tour of history and treasures dating back to Anglo Saxon times. They range from the gold and lapis lazuli illuminated Winchester Bible, perhaps finest of all surviving 12th-century English manuscripts, to a mysterious life-size statue of a man reflected in the flooded underground crypt, created by the modern British sculptor Antony Gormley. 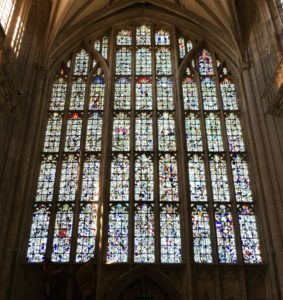 While many English cathedrals feature ancient pictorial stained-glass windows, our guide explained that an unusual abstract mosaic pattern in Winchester’s great west window was created from shards of glass recovered from a traditional design destroyed in the English civil war of 1650. A few steps away, we paused around a black gravestone set in the floor of the north aisle of the nave engraved “In Memory of JANE AUSTEN.” Although she was the author of some of the most celebrated novels in the English language, the text describes her personal virtues but makes no mention of her writing. Such pursuits were not considered appropriate for refined ladies of her time. Jane moved from Bath with her mother and sister Cassandra to the village of Chawton 17-miles from Winchester in 1809. The cottage where she wrote Sense and Sensibility, Mansfield Park and Emma is preserved as a museum. To seek help for a lingering illness, her sister drove Jane to a lodging house in the city where she died in 1817. Several novels were published after her death and her fame as a writer continued to grow. 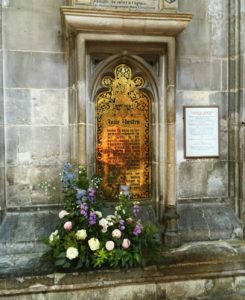 The cathedral finally acknowledged her vocation in 1870 when Jane’s nephew wrote a memorial for a brass plaque mounted on the wall above her gravestone. The inscription begins “Jane Austen, known to many by her writings …” . Thirty years later her fame swelled popular public support to fund an elaborate stained-glass window. Today Jane Austen’s portrait graces British ten-pound notes and tourists from all over the world pay homage at her grave. On leaving the cathedral, we walked past 8 College Street, the former lodging house, now a private residence marked with a plaque, where Jane died. From there we followed poet John Keats’s favorite walk for one mile through riparian meadows of “mists and mellow fruitfulness” beside the slow, meandering River Itchen to the Hospital of St Cross and Almshouse of Noble Poverty. This quadrangle of mediaeval stone buildings dating from 1136 is the oldest surviving charitable institution in the United Kingdom. The 250-mile drive from Winchester to the southern tip of Cornwall can be a delightful but extended excursion on minor roads or a faster (sometimes) but tedious stop and start drive through heavy traffic on major highways. 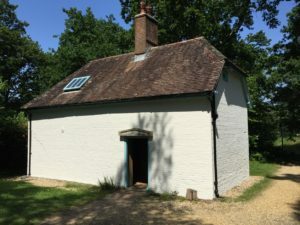 We chose the former option to include a stop at Clouds Hill, the National Trust’s rustic cottage retreat of T. E. Lawrence (of Arabia) nestled among pine trees in the Dorset countryside. Books and furnishings crammed into tiny rooms where he entertained friends and listened to music while serving at nearby Bovington Camp army base offered insight into Lawrence’s complex and fascinating character. Less than a mile down a narrow, wooded lane from the cottage, a stone monument marks the spot where he crashed his beloved Brough Superior SS100 motorcycle and died in 1935. From Dorset we drove west through the gentle green rural counties of Somerset and Devon. With occasional glimpses of the English Channel, the bucolic landscape of meadows and wooded hillsides gradually gave way to craggy, windblown uplands. We crossed bleak, desolate Dartmoor, setting for The Hound of the Baskervilles, and entered Cornwall in the late afternoon. Cornish landscapes come in two basic flavors: Picturesque coastal villages clinging to slopes around protected harbors and wild, brooding moorland punctuated by eroded granite outcrops, call tors. Doc Martin’s fictional seaside community of Portwenn, as portrayed by the real village of Port Isaac, typifies the former. 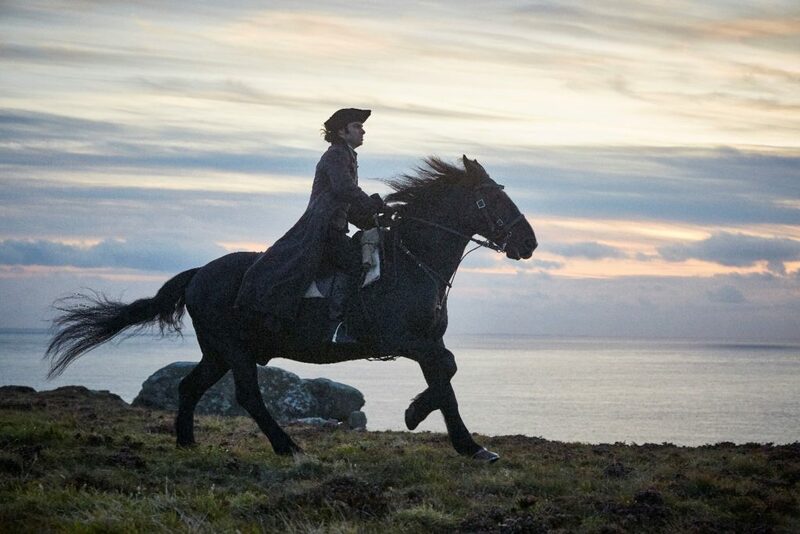 Windswept and carpeted with heather and grass, the latter provide the scenic backdrop for Ross Poldark’s cliff-top horseback charges into the sunset. Outside of the coastal towns, nearly 200 feet tall, derelict stone towers scattered across the landscape are the most distinctive human landmarks of Poldark Country. These engine houses of former mines, wheals in the Cornish language, are the above ground relics of tin and copper mining activity that began more than 2,000 years ago in the Bronze Age. Cornish Mining is included on the list of UNESCO World Heritage Landscape sites. Booms and busts over the centuries alternately produced wealth and mass migrations of miners to the far corners of the world in search of work, including to the hard-rock mines of California and Nevada. The last deep mines closed in the 1990s. Tourists in search of a glimpse of the roguishly handsome mine owner astride his beloved horse Seamus generate a more reliable source of income today. The Visit Cornwall website promotes a dozen filming locations used in the popular BBC series as well as others that inspired author Winston Graham. Two National Trust properties in West Cornwall are featured. The Levant Mine near St, Just, the fictional Tressiders Rolling Mill, houses the only existing working steam beam engine. Nearby Botallack mines portray Wheal Leisure and Grambler. They also provide the settings for some coastal clifftop encounters. 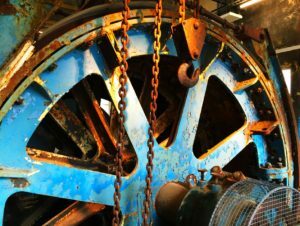 Visitors seeking an immersion in industrial archeology but traveling with children can satisfy both at Heartlands, near Redruth. A giant adventure playscape for kids is complemented by exhibits set in a former mine complex that tell the story of the rise and fall of the tin mining industry and its role in the community. Flower planters at the highway entrance to the nearby village of Troon (don’t confuse this with Troon in Scotland) caught our attention. Fashioned after the ubiquitous mine structures, with a tall chimney stack, peaked roof, and rounded-arch windows, the stout wooden boxes welcome visitors with seasonal flower displays. 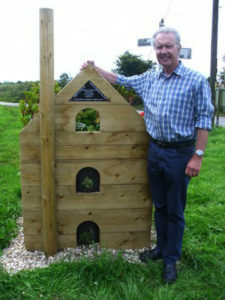 A sign on the box noted that they were created by local resident Clifford Selby. Cliff, a former mining engineer, produces these and other wooden crafts for sale in local fairs. He developed a popular byproduct when he realized that the window cut-out shapes from the planters were the perfect shape and size for fairy doors. Sprinkled with fairy dust and placed against a tree trunk in a child’s garden, for those with imagination the miniature doors create an opening into the magical world of elves and fairies. We placed one of Cliff’s fairy doors at the base of a live oak tree in our California garden. It certainly intrigues passing squirrels but we have not yet noticed any signs of enchanted activity. However, it continues to remind us of our Magical Masterpiece Mystery Tour of the ancient counties of south-west England. Travel planning websites: Visit Midsomer; Discover Winchester Cathedral; Poldark’s Cornwall; Heartlands World Heritage Site Exhibitions. Superb article, David, packed full of useful detail and charming writing. I’d like to follow your route one of these days. I’ve spent more time in the Middle East than I have in England. Ah, Poldark country! Thanks for posting.